Life, But How To Live It? I lifted the title of this post from the Norwegian mid-90s punk band of the same name. While not necessarily the biggest fan of their music, I have always loved their name. Six words can convey so much. 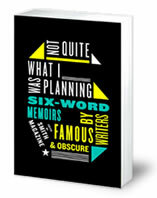 Smith magazine is releasing a book called Not Quite What I Was Planning: Six-Word Memoirs By Writers Famous And Obscure. This book was inspired by the tale of Ernest Hemingway writing a compelling narrative in only six words: “For Sale: baby shoes, never worn.” The excerpts from Not Quite that I saw at NPR offer humor (Well, I thought it was funny – Stephen Colbert) and heartache (I still make coffee for two – newly single 27-year old) in unexpectedly powerful ways. In my mind, “Watching quietly from every door frame” paints an entire history. If Linda Williamson had not already written it, Painful nerd kid, happy nerd adult would have been mine! Add your six-word memoir at the Bryant Park project (or just sort through gems like Miss you dad. You’d be proud and Job stinks. Art doesn’t pay. Dang amidst the assorted Yoda-sounding phrases).